Moorlands enjoyed a decent weekend in the Huddersfield League as they recorded a Premniership victory over Shelley on Saturday and overcame fellow top flight side Kirkburton in the Sykes Cup first round 24 hours later. Moorlands picked up their first league win of the campaign as they defeated last season’s Championship champions Shelley by seven wickets. Micky Padgett claimed 4-46 which helped Shelley to 160-9 when they batted first. Joe Sykes (69) stuck around but the visitors innings was kept in check before Moorlands eased to their target as Dave Winn (40), along with new signings, Nathan Rabnott (43) and Siraj Sajid (36) led the way. Moorlands then eased into the Sykes Cup second round as they overcame Kirkburton by 10 wickets. Opening bowlers Darrell Sykes (3-28) and Nicky Smith (3-16) produced excellent spells as Kirkburton were bowled out for just 94 having elected to bat first. Moorlands once again eased to victory openers Nathan Rabnott (55) finishing with a 34-ball half-century with support from Jared Maxwell (36). 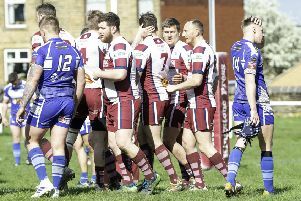 Mirfield Parish Cavaliers, promoted alongside Shelley last season, are still searching for their first top flight win after defeat at Armitage Bridge. Armitage Bridge had opening batsman Matthew West (44) in decent form but tghe wainstay of their innings was 79 from Wayne Swift as the home side posted 202-8. Jamie Hardcastle was pick of the Parish bowlers with 4-58. Experinced top order batsman Tim Orrell led the Parish reply with 44 but he lacked support as they were bowled out for 86 with home spinner Daniel Moorhouse returning excellent figures of 5-14. Parish bounced back with victory over Golcar in the Sykes Cup as they chased down the visitors first innings total of 243-6. Steve Whitwam struck a brilliant 102 and was supported by number five batsman James Howson (82) as they made a respoectable total. Orrell inspired Parish to a convincing six-wicket win as he struck a superb 126 from just 116 balls, in an innings which included 12 fours and eight sixes. He was supported by Daniel Broadbent (56) as Parish booked their place in the second round with 10 overs to spare. Mirfield secured an impressive 111-run victory over Denby Dale in the Conference last Saturday. P Scouller top scored with 35 in Mirfield’s innings of 187 all out before Nas Saudagar (4-40) and B McGuinness (4-19) combined with impressive figures to help dismiss Denby Dale for 76 in reply.